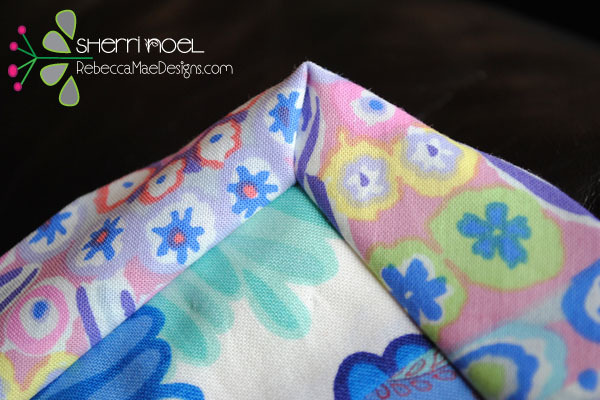 If you are ready to attach your binding then you should have your quilt sandwich all quilted. 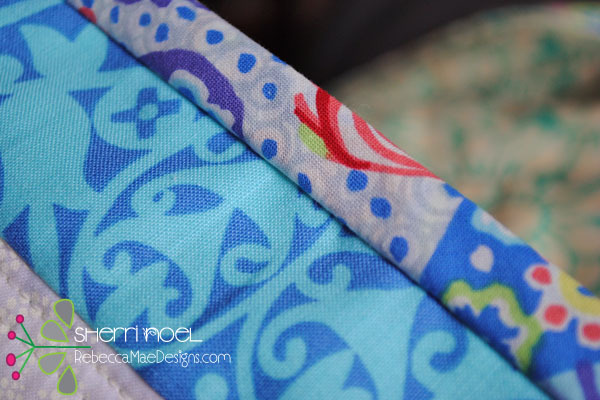 If you need to make binding, check out the tutorial on making bias binding. 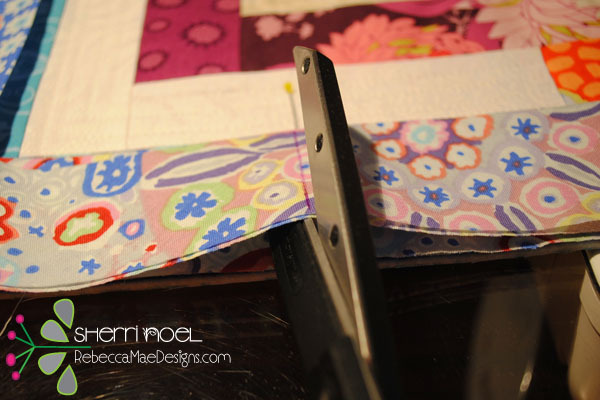 For this demo I’ll be binding my quilt block from the quilt sandwich tutorial so it’s easier to photograph. Optional ~ before trimming the batting / backing and squaring up the quilt top I like to topstitch using a 1/8″ seam around the perimeter of the quilt top. This extra step holds everything together for the binding. Use a walking foot to evenly move the three layers through the machine. Lay prepared binding along edge of quilt top (raw edges together). 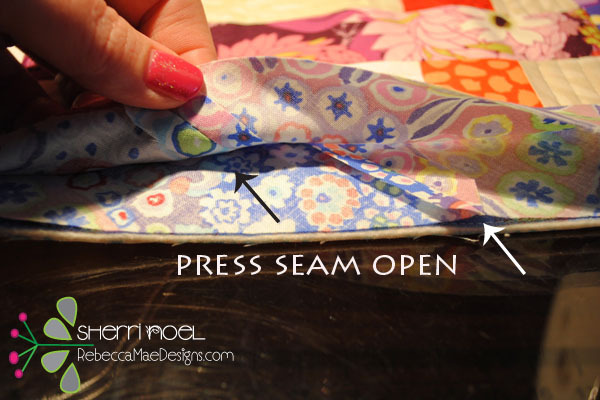 Note ~ A 1/4″ seam allowance is most common but I will be using a 1/2″ seam allowance in this tutorial. Read making binding for more info on seam allowances. 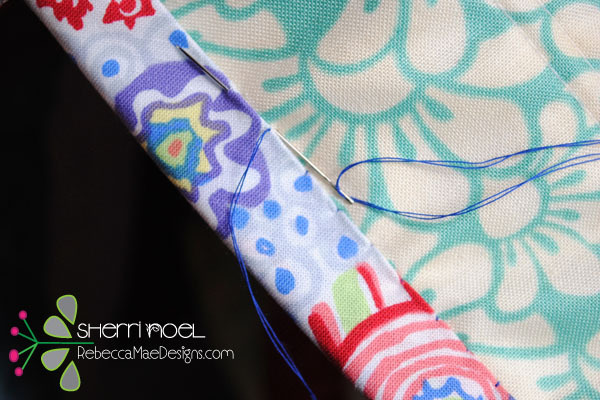 Leave a 10″ tail when you begin to allow for joining when you finish sewing around perimeter. 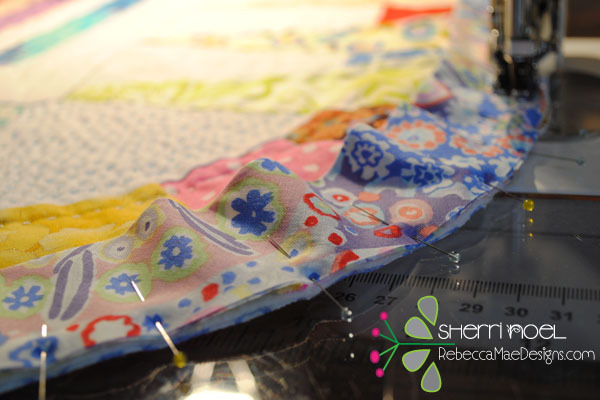 Begin sewing (backstitch to secure) and stop 1/4″ from edge of quilt top. Backstitch at stop. Fold binding to the right, finger press fold and place a pin to secure. It is important that your edges align. 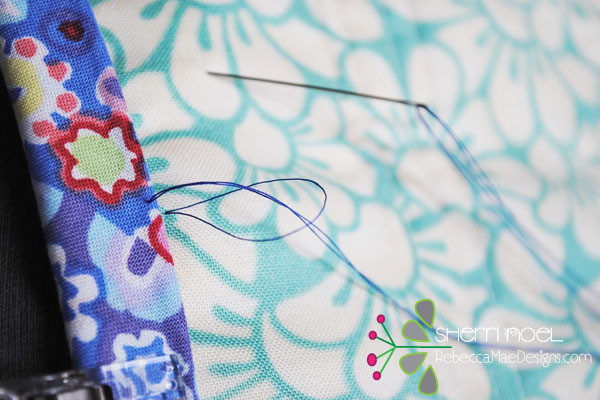 If your binding rests higher, you didn’t sew far enough, and if it rests lower, you stitched too far. Adjust now to avoid wonky corners later. 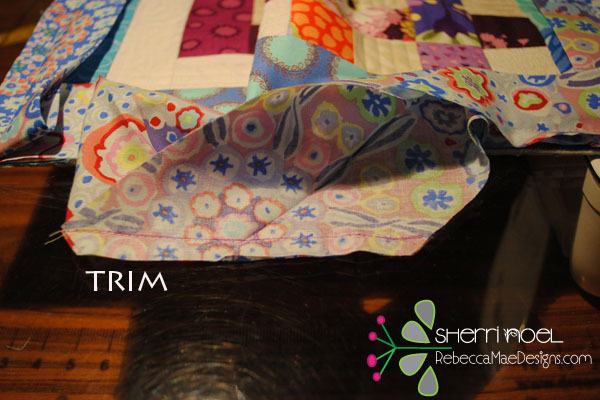 Fold binding to left and align with raw edge of quilt top. Make sure fold on right edge is aligned with side of quilt top. 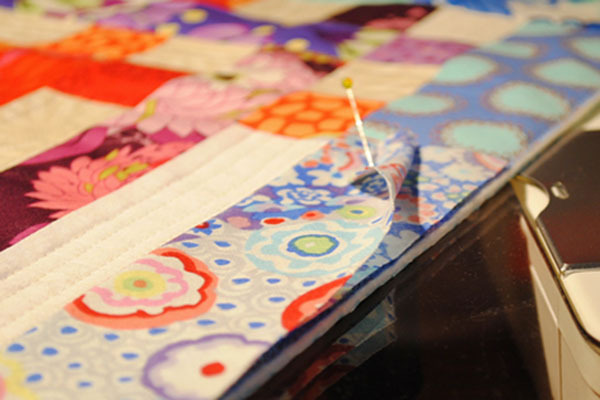 Turn your quilt and begin sewing at the edge. Remember to backstitch to secure. Repeat this process for each corner. When you come to the end leave yourself some room to work the two ends together ~ I usually shoot for an aprox 12″ gap. You should have two tail ends now. In the next picture I’m back to the start. You will notice my starting tail is on the left and ending tail is on the right. Overlap the starting tail with the end tail from the right and mark a cutting/trim line from where the pin is. 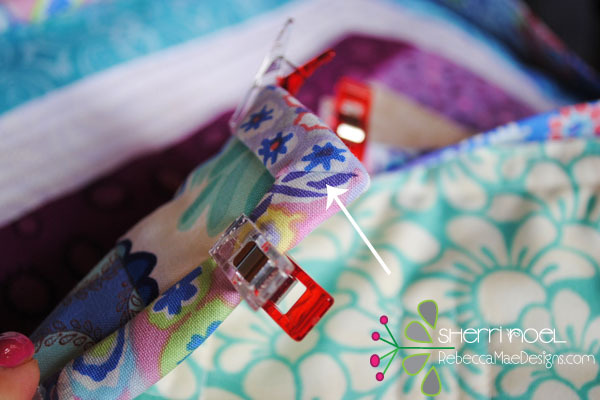 Gather your quilt top and clip or pin in place to give yourself some freedom to work the two ends together without tugging. Note ~ I’m using these wonder clips that are fantastic! Get yourself some, they are well worth the money! Without twisting, place your two ends right sides together in an “L” shape. Mark outside corner to outside corner and stitch together. Trim excess leaving 1/4″ below stitch line. 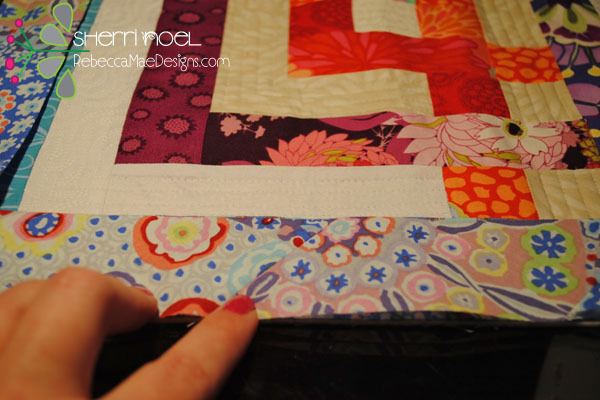 Remove clip holding quilt top and press binding seam open. Binding should lay flat and fit perfect. Notice diagonal seam distributes bulk nicely. Finish stitching down binding. Fold binding to back of quilt and notice the corners miter without fussing. When I adjust the mitered corners on the backside of my quilt I face the little slit ‘opening’ in the opposite direction, which distributes any bulk more evenly. In this next picture the ‘opening’ on the top side faces me. 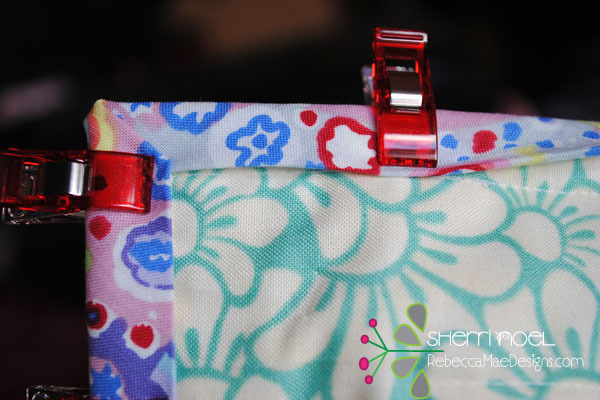 Rather than clip the binding in place around the entire perimeter I usually just use a few clips to hold my binding in place to get going and then I move them ahead of my stitching as I go. I’m going to hand stitch the binding to the back. Cut a length of thread. 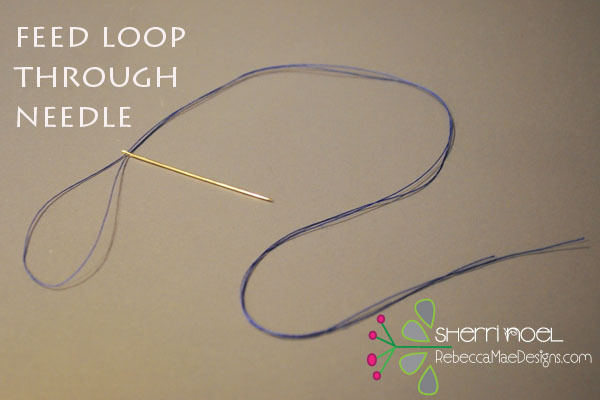 Fold it in half and feed the loop through your needle. Slide needle to other end. 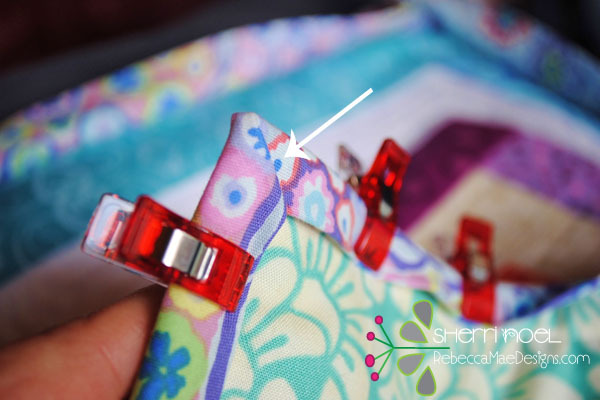 Begin sewing your binding to the back along any side you choose. Insert your needle right next to the binding and into the backing and batting only (not through quilt top) and then on your way up pick up the edge of the binding. Pull thread through until loop is close. 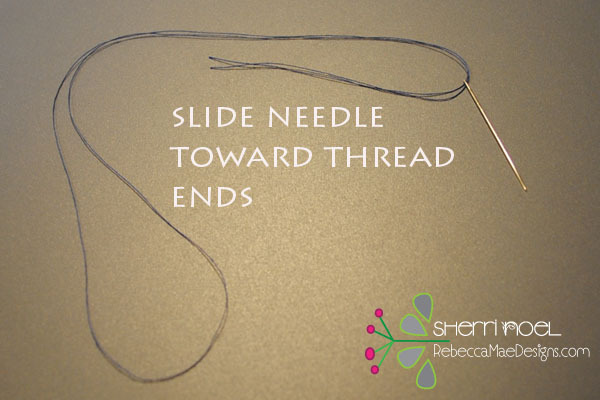 Feed needle (and thread) through loop. Insert needle (into quilt back and batting only) right next to where thread comes out of binding. 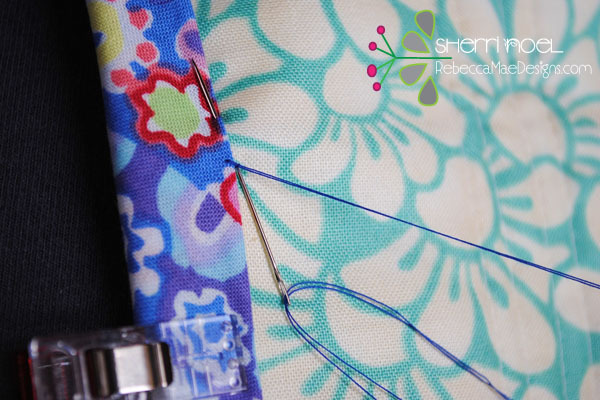 Bring needle out aprox 1/4″ away, just catching the edge of the binding. 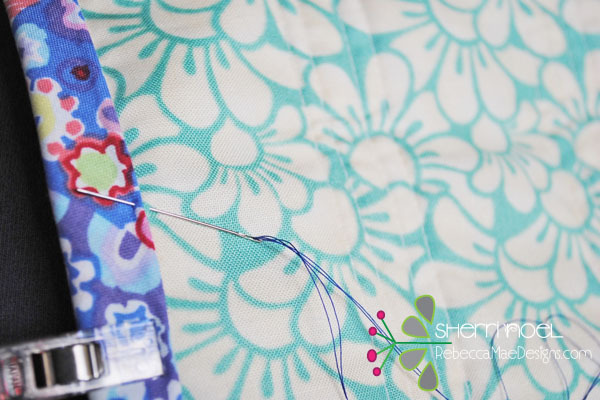 Continue this same stitch all the way around the perimeter until your finished! Admire your hand work! Admire your binding from the front too! 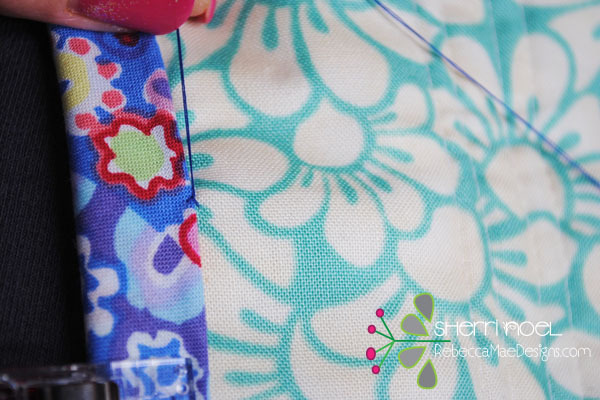 If you are binding around curved edges you start and end with the same method but you will simply curve your bias binding around the corners, pin in place, and stitch away. I Love this instruction. I will tuck it away in my Favs so I will always have it till I master the hand quilting..Thanks so much Sharon Decker,Norman Ok. Thanks to finding your site I was able to bind my small quilt after giving up on finishing because you are the only one to explain why the binding must rest perfectly. Mine was always high and I didn’t know why or how to fix it. I had given up starting any new projects. 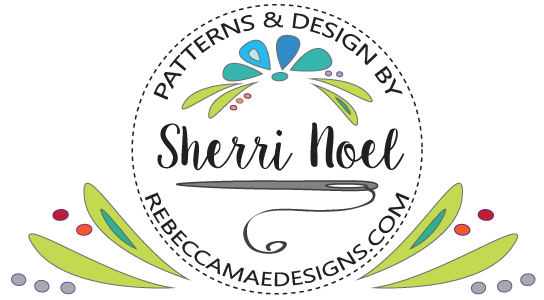 It may be something experience quilters know but I am learning on my own. Thanks to you I am able to finish my other unfinished projects and continue on my small quilts journey.